It is a month now since a second son left home to work in Canada. Isaac, my twelfth child and seventh son, graduated from University of Ulster with a degree in Public Relations. The twelfth child to get a university degree in our family. He worked hard and was diligent in his studies. His graduation ceremony was in the morning and he started his journey to Vancouver that night. Isaac desired to go to Canada again but he was not sure when to leave. He had secured the important two year visa. He had been given a token for 500 dollars towards a flight to Canada after he helped an unruly passenger on his last trip. He looked at flight prices at the end of June. After the third of July the prices to Canada went up. He was able to book a flight on the third of July, the day of his graduation, and the price was covered by the token. We had a great day celebrating with family but all too soon he was away. 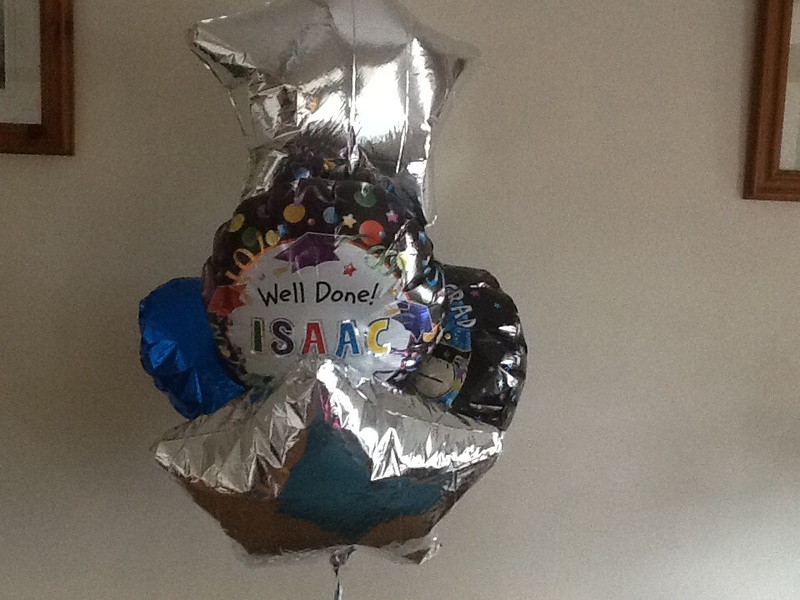 I returned home that evening with the celebration balloons, which are a bit deflated now. A bit like the way my heart was feeling. Over the next few days I was very tearful when I remembered Isaac. The car mats were all that was left of his car. His football gear was left in his room. Would he wear the Downpatrick shirt again? The towels on the floor of the bathroom and the empty bottle of aftershave were other memories. Isaac had lived at home for the past year and was a great support to my husband and I.
Isaac means laughter. He brought joy and comfort to us. He helped us both with IT skills. He helped with the house move. He got on well with other family members. He helped keep the home fires burning over the winter. He helped kept our home warm as well as our hearts. After Isaac left we both were a bit down. We both suffer silently our pain of two sons leaving home to work in Canada within a month of each other. I believe this scripture means one will have pain not only in having children but also in rearing children. Hence the heartache of separation after rearing children. My husband spent some time making a photo album of the graduation day. We remembered Isaac as we looked at the photos. God comforted our hearts and the pain has gone. It is now their time to make their way in live. Like the young birds they have to leave the nest. It is the way of life. We lay down our lives as parents to give life to our children. I know God has good plans for Isaac. He will prosper whatever he puts his hand to. I hear the screeching of sea gulls as they fly over the roof tops. It is a familiar sound in Aberdeen, the granite city. The bus takes us along the mile long street, busy with buses, cars and people. Ah I am back in Aberdeen for my son’s graduation. As well as the gulls, I hear the sound of helicopters overhead. This is a sound familiar to us who are from Northern Ireland. Military helicopters patrol the sky particularly at this time, when trouble could erupt again. But unfortunately it is not a sound of prosperity back home in Northern Ireland. It reminds us of the need for surveillance because of continued tensions between communities in Belfast. In Aberdeen the helicopters transport goods back and forth to the oil platforms. Aberdeen is prospering because of the oil industry. I counted fifteen large ships anchored offshore waiting to get into harbour. Today, my husband and I am in Aberdeen for my son Jacob’s graduation in Law. I remember our visits to this sunny, granite city. Our daughter Mary graduated as a Doctor eight years before. We enjoyed walking the long stand with the sunshine on our backs. The people are warm and welcoming. Two of our children have been blessed here. There is no recession here. New office blocks are being built. New shopping malls being planned. There are a hundred oil platforms offshore. A lot has happened to me in the years since I first visited Aberdeen 15 years ago. We moved house from Coleraine to Downpatrick, we have reared nine other children who have left home, I haved had fourth stage cancer and have been healed and am alive to tell the tale. When I was suffering from cancer and did not know it, six children were still at home. I was depressed so that would have had an affect on my children. Jacob was studying for his A levels. He did not get the required results and had to repeat a subject. He was another year at home. It must have been difficult for him. He heard the news I had cancer when he was volunteering in Soweto, South Africa. More emotional pain. Only God knows how he must have felt being so far from home. When he returned I was going through cancer treatment. He was accepted to do Law in Aberdeen, where he has been studying for the last four years. I am alive to celebrate with my son his Graduation from Law School. Perhaps his college friends or lecturers did not know the stress my son was under the previous couple of years. His mum suffering from cancer, and this playing on his mind. But God knew and has been with him. When he came home at term time I noticed he had very bad acne. I did not say anything. Acne is related to stress. I noticed recently that his skin is clear. He volunteered that he had gone to the doctor about his acne earlier in the year. He took some medication the doctor prescribed. After a week he stopped taking it because of the side affects. He decided to cope with the stress he was under by listening to music and relaxing by playing music. He was healed. I am so thankful to God for this healing. I watched a programme that showed the side effects of some treatment that is given for Acne. It causes depression! Today we celebrate with him the victory over our circumstances. He finished the race and has won the reward. He has Graduated from The School of Law, University of Aberdeen. I am Being Restored and my Youth Renewed. Do you ever feel you are tired and weary and can’t go on. When we moved to our present home in Bright, a neighbour said you will get ten years added to your life living here. Brendan and I were getting like the last house we lived in before we moved. It was old, creaky, felt the cold, windows getting dim, and walls needed new coats of paint. We could not do all the work needed for its upkeep any more. Like the house we needed some loving care. Brendan always mended leaks, fixed fuses, fixed washing machines when they stopped working, fixed door handles, changed light bulbs, got Internet access working and much more to keep the show going to rear 14 children. Our present home is a new house. Behold I make all things new. My husband said “Praise The Lord” when he realised he didn’t have to fix anything any more. Alleluia. It is warm at the flick of a switch and from the sun streaming in the windows. No more cold and having to light fires. It has thick walls that are sound and strong and insulated. Our eyes are brightened with the sunshine. We have been out for ventures on our bicycles. I have a new coat for our sons’s graduations. God has given me a garment of Praise instead of a heavy spirit. No more fixing for Brendan. I do not have as much cooking, washing, cleaning, or grocery shopping. Although I have pain as children leave home to settle other countries, God has not left me. Jesus promised us the Holy Spirit who is my Comforter. I are blossoming where I am planted like our plants in their pots. I receive the rain that falls on me and I are at rest. My youth is being restored and I will rise up with wings as eagles. We flew to Aberdeen today for our eleventh son’s graduation from Law School. We passed a big shop that is called “Bright House”. My future is Bright and Beautiful. God has done this for me. God is faithful to care for me, when I am worn down by circumstances. He revives my drooping spirits. I hope in his promises. I am writing all that has happenend recently to encourage you who read this. What God has done for me he can do for you, no matter where you live. God has healed me from fourth stage cancer and providing an environment where I remain healed. Turn to God and believe in his son Jesus and receive his Holy Spirit. He will make all things new for you.